SS Resource Tycoon: New Angel Celeste Arrives in Angels Land!!! [Announcement] SS Resource Tycoon: New Angel Celeste Arrives in Angels Land!!! SS Resource Tycoon: New Angel Celeste Arrives in Angels Land! Celeste, Angel of Stars, lives on a distant planet far from the madding crowd for thousands of years. One day she heard a voice whispering in the space, "War is coming. We need to unite." This sounds constantly echoes around her mind, and then she decided to track the sound to find out the truth. Finally Celeste comes to Angels Land, and she will make her debut in Single-server Resource Tycoon from Nov. 8th to Nov. 13th. Angel Celeste controls great magic power, whose skill is called “Celestial Arrow”, by which she will deal enormous magic damage to all enemies and increase all party’s Crit Damage, Crit and Agility by 18% with a 100% chance of hitting, lasts 3 turns! Hurry up to invite Celeste into you squad, and she will bring victory to you! Join us in the Single-Server Resource Tycoon from Nov. 8th to Nov. 13th to compete for new angel Celeste! 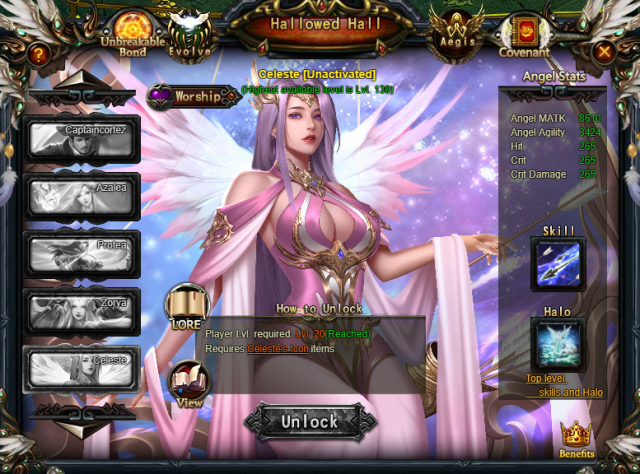 Play League of Angels now and embark on an epic journey! We originally scheduled DW for 2100 on 9 November. Today the DW activity page shows a 1630 start time for the 9th! Additionally, we note that our schedule page still shows DW with a 2100 start time. We scheduled DW for 2100 a few days back......now we don't know if we have two DWs for 9 November(1630 and 2100) OR only the 1630 DW that we did not schedule. We have no idea why our schedule correctly shows 2100 for DW BUT the DW activity page shows a 1630 start. We are working at 1630...that why we scheduled DW for 2100. We have no clue why start time is now 1630. Please comment......we don't want to miss a DW in SS Tycoon because of the point benefits. PS, a similar incident was reported in the "Bug" section of forum.